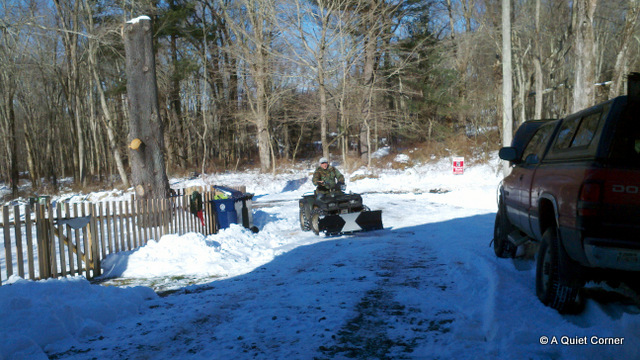 Last week when I came up the gravel road from getting my haircut, there he was...plowing! Waiting patiently until he finished scraping the driveway clear, a smile came across my face just watching him. He looked as if he was enjoying himself and his new toy. No, he wasn't plowing with his diesel. He was tooling around on the ATV with it's new accessory! He had put it together and hooked up the winch the day before and was chomping at the bit to go try it out! He did the driveway, the parking spots and even did a strip down the gravel road. Then he cleared the snow piled along the entrance. I know how to drive the ATV. I know how to plow. I can't wait to give this a try! Did I ever tell you that I aced Logic and Statistics in college? I've been bugging my hubby for an ATV and after dragging a deer for quite a ways, I think I've got him convinced. I can't wait to hear all about your plowing adventures. Wow, this is very cool! I have seen people around here with little plow scrapers attached to their big vehicles. If Arlynda would get me one of them, I would go shopping at Wal-Mart all of the time for her! I miss seeing snow. When I used to go back to NJ in the winter to check on my parents I loved to grab the snow shovel and dig right in. I guess because it had become a novelty I enjoyed it. You're in a rural area and need that ATV. Are you in the western part of the state?